We must apologise for the lack of communication from us over the past few months with the absence of our monthly letter. An attack of life for both of us over the past few months pushed writing the letter from our to do lists, and, as ever with procrastination, such neglect compounds itself as the task to be tackled gets bigger with each delay. So we shall start anew where we are, and apologies to any whose achievements and triumphs did not get the coverage they deserved. However delayed, we cannot go on without acknowledging the magnificent triumph that was the Theatre of Food Feast in December last year. The sweeping vision and meticulous execution of Sir Guillaume d’Oze and his team combined to pull off an event that was all he promised and considerably more. Our deepest thanks must go to Sir Oze and the Honourable Lady Elena Anthony and their team, but above all, to Oze’s family, Star and John King, Lady Elizabeth Stumpe and Martin, without whose tireless work before, during and after the event, his ambitious vision would never have been brought to life. We would also like to recognise all the servers, whose attentive and surely exhausting labours provided a magnificent experience for all the guests on the night: Lord Richard of Dunheved, Lady Elspeth Jamieson, Tamsin, Benjamin the Younger, Sukeyoshi and particularly Lord Erlendr Tryggvason. And Lady Elizabeth Stumpe was a magnificent Queen Bess, whose sparkling presence and narration held the event together. We enjoyed the company of many wayfarers for the evening, but it was a particular pleasure to have members of the Politarchopolis Assault Catering Corps as our guests, and then see so many of our populace attending the classes they generously offered on the Sunday. Fickle weather has been dogging the Canton of Lightwood’s events of late, with the Silver Arrow Tournament, to be held as part of their birthday celebrations in November, being postponed twice due to torrential rain, and now the fifth St Sebastian’s Archery Tournament, due to be held on this very day, being postponed to the end of the month due to extreme heat and severe fire danger. The Canton also suffered earlier this year with bushfires causing many members (including Baroness Adelindis and her family) to flee their homes for nearly two weeks, although fortunately none were lost to the flames. We do hope that the weather is somewhat kinder to our beleagured lands for the rest of the year! We opened our events for this year with the Ancient Worlds Taverna Feast, held on 23 February. We commend Lord Erlendr on the success of his first event as steward! At the event were held the Summer quarterly tourneys, which saw the Bronze Falchion bestowed upon Lord Erlendr and the Silver Lymphad upon THL Declan of Drogheda. Baronial cyphers were awarded to Lord Joab Cohen, Baroness Beatrix Aðíslsdóttir y Jelling and Lord Marcus the Gaudy, for their service to ourselves and our Barony. The event also saw the changeover of the offices of Constable and Rapier Marshal, with Lady Deirdre inghean ui Neill and Lord Perran of Lyskyret being replaced by Lord Richard and THL Declan respectively. The position of the Captain of our Guard changed also, with Lord Joab stepping down to be replaced by Lady Morwenna de Bonnay. We thank all these gentles for their dedication and service during their terms. And we would remind our populace that our Chirurgeon and Herald are both seeking replacements. 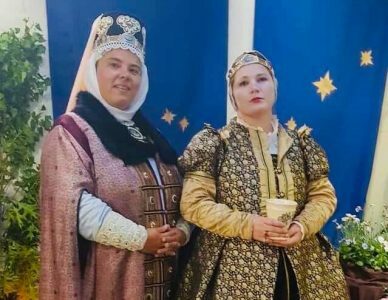 In other news, Adelindis was fortunate to attend the glorious Twelfth Night Coronation, held by the Barony of Krae Glas, to farewell Kinggiyadai Khagan and Altani Yeke Khatun as they stepped down from the throne, and welcome King Felix and Queen Eva. Alas, it is our sad duty to inform you that They are unable to travel to Their lands of Ynys Fawr during this reign. Looking ahead, Baroness Anna is planning to attend Rowany Festival next month, along with quite a number of the populace. And we are looking forward to attending the sixth Little Bit of Rapier, to be held at the end of May, in conjunction with the Autumn quarterly tourneys.